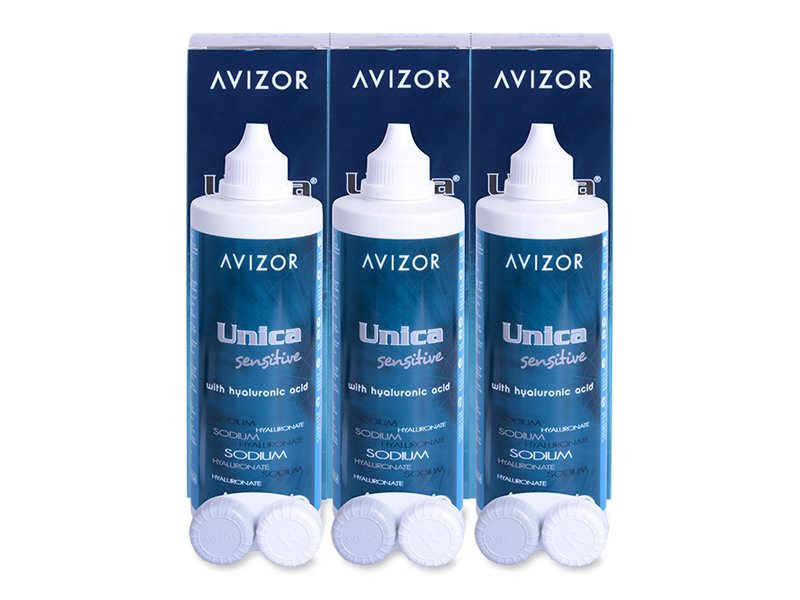 Unica Sensitive from Avizor is a multipurpose contact lens solution for the care and maintenance of all types of soft contact lenses. Enjoy our economy packs at great prices. 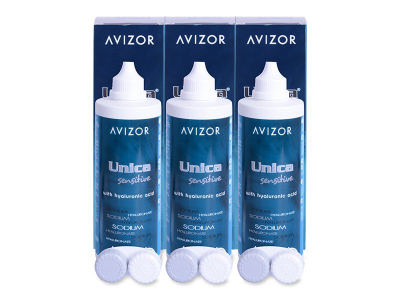 Avizor Unica Sensitive Multipurpose Solution features an advanced formula that cares for the comfort of contact lenses wearers with sensitive eyes. We are pleased to offer a convenient triple pack containing three 350 ml bottles and three contact lens cases for storage and travelling. The composition of the solution is enriched with sodium hyaluronate, which has been proven to increase the comfort and hydration of wearing contact lenses. Sodium hyaluronate is a natural lubricant that provides an extra dose of moisture to keep lenses comfortable and hydrated throughout the day. For perfectly clean and hygienic lenses, keep them in solution for at least 4 hours in between uses. The manufacturer recommends discarding any remaining solution 90 days after first opening. We also offer smaller double packs as well as single 350 ml bottles.